The initial Bell 204 prototype. Three prototypes were built. Six aircraft for evaluation, as XH-40 with 12-inch cabin stretch and other modifications. One YH-40BF rebuilt as a flight test bed with turbofan engines and wings. Initial Bell 204 production model, redesignated as the UH-1A in 1962. 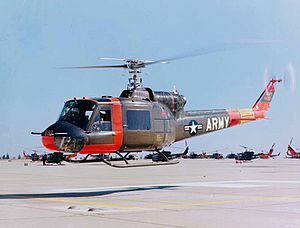 The HU-1 designation gave rise to the popular but unofficial nickname "Huey". UH-1A with dual controls and blind-flying instruments, 14 conversions. A single UH-1A was redesignated for grenade launcher testing in 1960. Upgraded HU-1A, various external and rotor improvements. Redesignated UH-1B in 1962. A single test aircraft, serial number 64-18261. UH-1B with improved engine, modified blades and rotor-head for better performance in the gunship role. Seven pre-production prototypes of the UH-1D. Initial Bell 205 production model (long fuselage version of the 204). Also built under license in Germany by Dornier. Rescue/fire fighting variant of UH-1D. 98 production Cobra gunships with the Enhanced Cobra Armament System (ECAS) featuring the M97A1 armament subsystem with a three-barreled M197 20 mm cannon. The AH-1E is also referred to as the "Upgunned AH-1S", or "AH-1S(ECAS)" prior to 1988. UH-1B/C for USMC with different avionics and equipment. UH-1C configured for Marine Corps training. Twenty built in 1965. "Modernized AH-1S", with upgraded avionics and defensive systems. UH-1B/C for the USAF, with General Electric T-58-GE-3 engine of 1,325 shp. Instrument and Rescue Trainer based on the UH-1F for the USAF. Designation given locally to UH-1D/H gunships operating with the Cambodia armed forces. Initial 1966 production model of the Cobra gunship for the US Army, with one 1,400 shp Avco Lycoming T53-13 turboshaft. One Cobra helicopter modified for armament testing, including Hellfire missiles and multi-barrel cannon. Improved UH-1D with a Lycoming T-53-L-13 engine of 1,400 shp; 5,435 built. Also built under license in Taiwan by AIDC. Canadian Forces designation for the UH-1H utility transport helicopter. Redesignated CH-118. Twenty-two aircraft converted by installation of AN/ARQ-33 radio intercept and jamming equipment for Project Quick Fix. SAR variant for the USAF with rescue hoist. 30 built. Five UH-1Hs converted to SOTAS battlefield surveillance configuration with belly-mounted airborne radar. Modified UH-1Hs for use as basic helicopter flight trainers by the USAF. Original twin-engine SeaCobra version, subsequently upgraded and exported to Iran as AH-1J "International"
An improved Japanese version of the UH-1H built under license in Japan by Fuji was locally given the designation UH-1J. Purpose built SAR variant of the Model 204 for the US Navy with USN avionics and equipment. 27 built. Helicopter flight trainer based on the HH-1K for the USN. Utility variant of the TH-1L. Gunship specific UH-1C upgrade with Lycoming T-53-L-13 engine of 1,400 shp. Initial Bell 212 production model, the Bell "Twin Pac" twin-engined Huey. 100 production aircraft with composite rotors, flat plate glass cockpit, and improved cockpit layout for nap-of-earth (NOE) flight. The AH-1P is also referred to as the "Production AH-1S", or "AH-1S(PROD)" prior to 1988. UH-1F variant for USAF for special operations use and attack operations used solely by the USAF 20th Special Operations Squadron, "the Green Hornets". Upgraded AH-1G equipped with the M65 TOW/Cobra missile subsystem, M65 Telescopic Sight Unit (TSU), and M73 Reflex sight. Proposed version for Romania as Dracula. AH-1W on a training mission at the Mojave Spaceport. AH-1Q upgraded with a 1,800 shp T53-L-703 turboshaft engine. Named Improved SeaCobra, features an extended tailboom and fuselage and an upgraded transmission and engines. Single prototype for Counter Mortar/Counter Battery Radar Jamming aircraft. Crashed at Edwards AFB during testing. Aeromedical evacuation, rescue version for the US Army. SuperCobra variant, nicknamed "Whiskey Cobra", day/night version with more powerful engines and advanced weapons capability. Electronic warfare UH-1Hs converted under "Quick Fix IIA". Named Venom, upgraded variant developed from existing upgraded late model UH-1Ns, with additional emphasis on commonality with the AH-1Z as part of the H-1 upgrade program. Named Viper, or also "Zulu Cobra", it includes an upgraded 4 blade main rotor and adds the Night Targeting System (NTS). Offered as King Cobra to Turkey for its ATAK program and selected for production in 2000, but later canceled. Canadian Forces CH-135 Twin Huey in service with the Multinational Force and Observers. Upgraded commercial version, named Ultra Huey, fitted with a 1,400-kW (1900-shp) General Electric T700-GE-701C turboshaft engine. 11 seat utility transport helicopter; the civil certified model was based at the military model 204, known by the US Army as the UH-1B. 11 seat utility transport helicopter. Built under licence in Italy by Agusta. Anti-submarine warfare, anti-shipping version of the AB 204 helicopter. 11 seat utility transport helicopter. Built under licence in Japan by Fuji Heavy Industries. 15 seat utility transport helicopter. 15 seat utility transport helicopter. Built under licence in Italy by Agusta. 15 seat utility transport helicopter, initial version based on the UH-1H. Modified version of the AB 205. 15 seat utility transport helicopter. Built under licence in Japan by Fuji. Field upgraded 205A utilizing a T53-17 engine and a 212 rotor system. Similar to the production 205B and 210. A 205A-1, but with armament hardpoints and military avionics. Produced specifically for Israeli contract. Prototype fitted with two Gnome H 1200 turboshaft engines. Prototype fitted with two Turbomeca Astazous turboshaft engines. Experimental twin-engine "Twin Huey" prototype. Original AH-1G prototype with retractable skid landing gear. The HueyTug, was a commercial version of the UH-1C with an upgraded transmission, longer main rotor, larger tailboom, strengthened fuselage, stability augmentation system, and a 2,650 shp (1,976 kW) Lycoming T-55-L-7 turboshaft engine. Experimental AH-1 demonstrator version fitted with a four-bladed rotor system, an uprated engine and experimental equipment, including Hellfire missiles. Experimental version powered by one Lycoming T-55-L-7C engine. 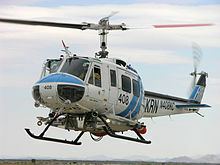 Bell 212 with a four-bladed semi-rigid rotor system. A modified and re-engined UH-1H, significantly upgrading its performance, and its cost-effectiveness. Currently offered by Bell to all current military users of the type. Pratt & Whitney Canada name for a modified UH-1H with a new PT6C-67D engine, modified tail rotor, and other minor changes to increase range and fuel efficiency over the Bell 212. Upgraded commercial version, fitted with an LHTEC T800 turboshaft engine. Unlicensed version made by Panha in Iran. Unlicensed Iranian upgrade of the AH-1J International. ^ a b c d e f g h i j k l m n o p q r s t u v w x y Mutza, Wayne. UH-1 Huey In Action. Carrollton, Texas: Squadron/Signal Publications, 1986. ISBN 0-89747-179-2. ^ a b c d e f g h i j k l Andrade, John M. U.S. Military Aircraft Designations and Serials since 1909. Hersham, Surrey, UK: Midland Counties Publications, 1979. ISBN 0-904597-22-9. ^ a b c d e Bishop, Chris. Huey Cobra Gunships. Osprey Publishing, 2006. ISBN 1-84176-984-3. ^ a b Donald, David. The Complete Encyclopedia of World Aircraft. Barnes & Nobel Books, 1997. ISBN 0-7607-0592-5. ^ "Bell CH-118 Iroquois." Archived 2006-05-10 at the Wayback Machine Canadian DND webpage. Retrieved: 30 August 2007. ^ UH-1J　多用途ヘリコプター. Retrieved: 11 December 2007. ^ "Back to square one in attack helicopter plan" Archived 2006-12-06 at the Wayback Machine, Turkish Daily News, 2 December 2006. This page was last edited on 11 November 2018, at 21:13 (UTC).